MP Dusica Stojkovic is heading the Serbian delegation to the International Parliamentary Seminar on the Western Balkans in London, 10-12 September 2018. Speaking at the panel on strengthening the rule of law and anti-corruption measures, as best practice examples, Stojkovic presented the measures employed by Serbia to fight corruption and announced the upcoming adoption of the law on the anti-corruption agency and law on lobbying which would provide Serbia with the legislative framework for future anti-corruption efforts. 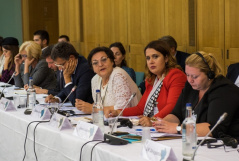 The seminar, organized by the UK Parliament and the British Group at the Inter-Parliamentary Union, covers the parliamentary perspectives of the Western Balkan Summit, held in July, and the active engagement of parliamentarians within the Berlin Process. The National Assembly delegation took active part in the seminar and its open dialogue on a number of topics of importance for the Western Balkan region, among them the shared challenges and priorities facing the Western Balkans with regards to democratic processes, the need for inclusive politics and inclusive parliaments, with a particular focus on women, young people and civil society, regional, economic, security and cooperation to promote fair and humane migration, as well as maintaining political will and what parliamentarians intend to do to ensure that pressure is applied on their governments to carry through with the commitments they made. The delegation also comprises MPs Gordana Comic and Mladen Grujic.